"Pie Baking Frenzy" is officially underway here at Eckert's! Our bakery is pumping out pies like nobody's business. This is our biggest pie baking week of the whole year and we prepare months in advance to get ready for it. Our round-the-clock baking teams are in constant motion as they prep, tray and package over 16,000 pies. I love that our bakery is part of so many Thanksgiving dinners in the St Louis area. It is fun to think about how many households have an Eckert's pie box in their kitchen!! How about you? Will you have an Eckert's pie this holiday season? I must admit, all this talk about pie does have me feeling sorry for desserts of the crustless kind! So, when I saw this recipe for Pumpkin Creme Brulee, I just had to give it a try. This creamy custard with a nod to pumpkin is delightfully delicious, so much so, that we will be featuring it in our upcoming Holiday Wine and Foods Classes in December. 1. Use shallow ramekin dishes, 4-6 oz sizes work best. 2. Make sure egg yolks are well separated from the whites (no whites are used in this recipe). 3. Watch the cream like a hawk! Increase heat gradually and stir constantly. 4. Be very careful NOT to get any water in the custard when placing ramekins in the water bath. My kids both LOVE creme brulee! I was a really excited to make this seasonal spin on the classic recipe and as I expected, they both loved it!! I hope you will give this recipe for Pumpkin Creme Brulee a try this holiday season. Preheat oven to 350-degrees F. Place baking rack in center of oven. In a 13 x 9-inch metal pan, place 6 (4-ounce) oven proof ramekins. Set aside. In a 2-quart sauce pan, bring the cream and vanilla to a boil, while stirring, then immediately take off heat. In a large bowl, whisk together the yolks, nutmeg, and sugar, then add the pumpkin and mix until smooth about 1 minute. When the cream has cooled a bit (stir occasionally), add it slowly to the egg mixture, stirring or whisking constantly, taking care the eggs don’t lump up and cook. Divide the custard among 6 ramekins. 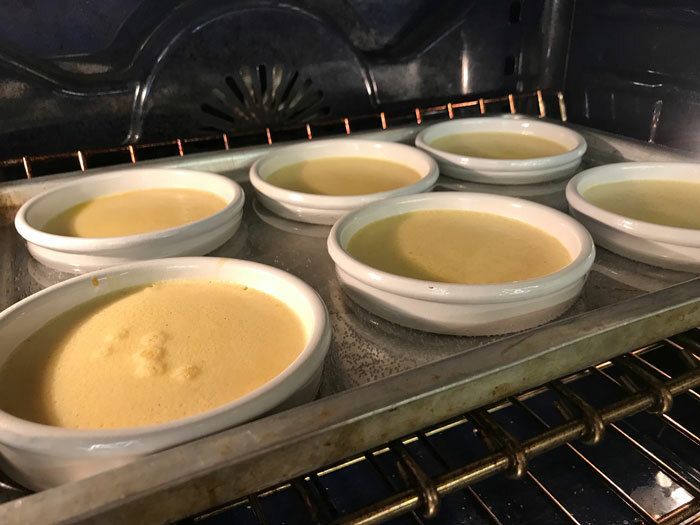 Bake until the sides of the custards are set but the centers move slightly when shaken; about 45 minutes. Using tongs carefully remove ramekins from the water bath and transfer ramekins to cooling rack. Refrigerate at least 2 hours. When ready to serve, preheat broiler. Sprinkle sugar evenly over custards and broil them about 8 inches from the heat source until the sugar begins to caramelize, but not so much as to burn; about 30 seconds. If you have a kitchen butane torch, you can caramelize each top individually without an oven.